It was a historic night in the NFL as Drew Brees became the all-time passing yard leader. 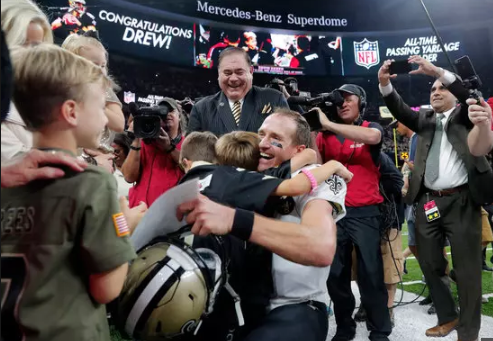 The 39-year-old quarterback of the New Orleans Saints broke history yesterday by passing legendary quarterback, Peyton Manning in most career passing yards in NFL history. His record-breaking night couldn’t have played out any better, as the Saints drown the Washington Redskins in a 43-19 victory. Brees’ pass to rookie receiver Tre’Quan Smith in the second quarter saw him recording a 71,968 career passing yards. After his new record was announced, it was all smiles and hugs for the quarterback. There was a timeout to celebrate the new record, and luckily Brees was mic’d up, so we had a sneak peek at what greatness sounds like. He celebrated with his teammate, before going to the stands to celebrate with his wife, baby daughter and three sons, hugging his boys and telling them how much he loved them. Before then he was handed the game ball. He was also congratulated by NFL hall of fame president, David Baker. For fans of the game, it was a warm moment to witness. In an interview with ESPN’s Lisa Salters, he said, “there were a lot of people I wanted to prove right tonight, but none more so than them. I know they are watching down on me.” ‘Them’ referring to his late mom and grandfather, who he said are responsible for his football career. Brees’ accomplishments go far beyond his current record. He was MVP of the league, the first time the Saints ever made it to the super bowl. He has had the most years of being the league’s leading passer. (7).